I love my weed garden (there is not a single cannabis plant to be found). I am the only human in the house that shares this sentiment. Over the years I have planted trees, shrubs, annuals and perennials around the house and throughout the yard. Digging here is much like anywhere in Georgia; there is red clay and there are rocks, rocks of every size, shape and mineral imaginable. The rocks went into a pile; I called it, my pile of rocks. 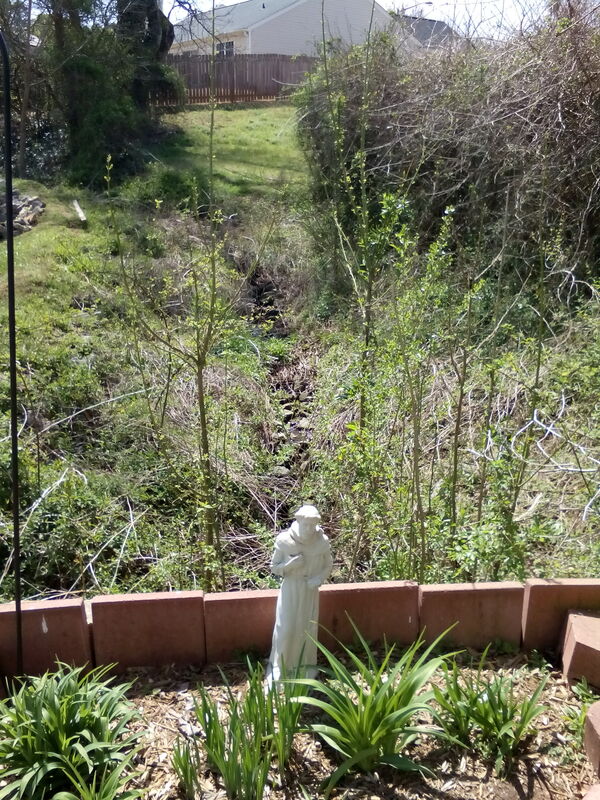 On one particularly hot summer day, four years ago, I envisioned a rustic rock wall, along the culvert that made an eight foot deep cut into the little hill that is my back yard. The culvert runs for about a hundred feet before sliding into the five foot diameter drainage pipe beneath the lane. It was an ambitious plan and after careful thought and a chilled beverage, I scaled back my vision of a wall to about twelve feet. Even so, it was still a lot of rocks to move. As happens with many of my visions, things changed. 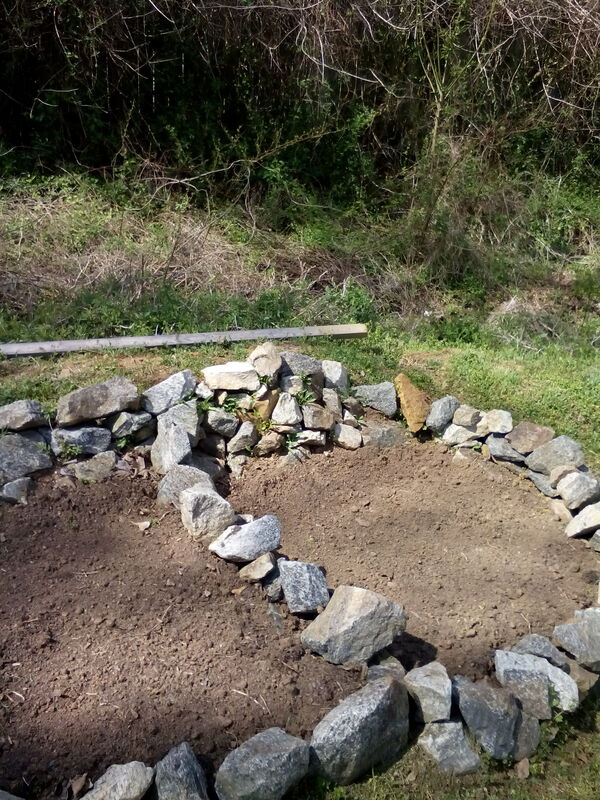 The wall I envisioned moved from the top of the hill; I carved instead into the bank and stacked the stones. Just beyond the top of the wall was every imaginable natural, wild growth to be found in Georgia. One year the rains carried blackberries, blackberries that grew in grand proliferation; to the delight of the neighbor’s children as they approached the brambles with buckets and visions of jams and pies. The storms came and as storms are want to do, they brought change; the blackberries were soon replaced with fragrant honeysuckle (and poison oak, not the best year). It was that year of the ‘fragrant itch’, in late spring the wall evolved, into a garden. The pile of rocks all but disappeared and became three small, terraced sections, bordered by rough stone walls. Taken as a whole, the garden was shaped like a leaf. I turned the earth, that wonderful Georgia red clay, and added fresh soil and turned it again. 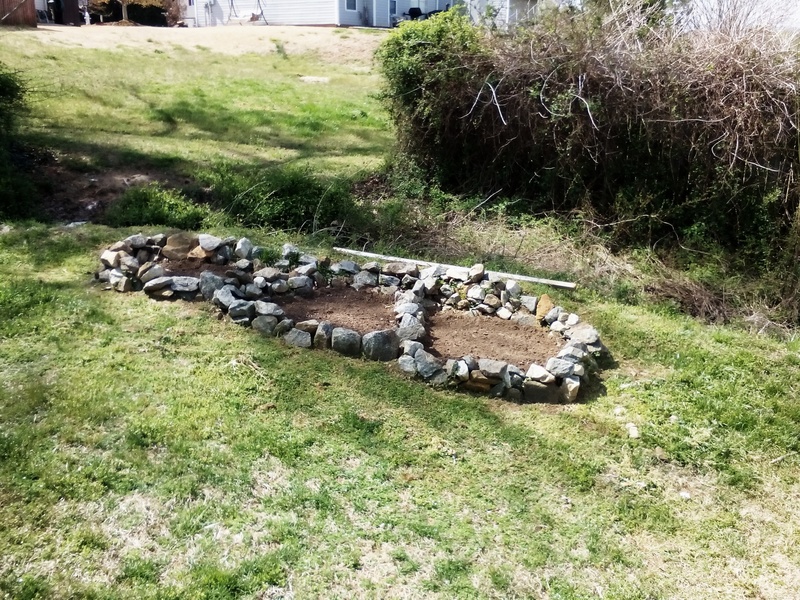 I planted… wild flowers. In a few short weeks, tall, gangly green plants had pushed through the soil and raised their heads of yellow, orange, blue and red to the summer sky; and then the fun started. Bumble bees from three counties took up residence, along with a host of butterflies and by early July, the humming birds. I took to having my morning coffee; sitting on the wet grass beside the garden, the new inhabitants took little or no notice of me even the feral gerbils that had burrowed their way in (chipmunks). As it is every Spring Season, the garden is overrun with weeds and leaves from the old sycamore that had at last surrendered to the assaults of wind and lightening. Vines of various types had worked their way up from the culvert and through the cracks in the wall; some moved the stone in sections and that part of the wall would be redone and others anchored the stones in place, like a living thing. Familiar earth, rich and black, turning easily, as a familiar shovel blade cut into it, weeds give up their hold, for a season. Soon I’ll sit quietly in the grass and listen to the sweet music from my little weed garden. And I’ll smile, a lot. There is something really magical about spring in this part of Georgia. The horse ranches have been driven out of the state by developers, but there are still the sheep. To get to the store from where I live I have to drive by a sheep farm, and this is the time of birthing. The SWMBO may send me out for a pint of 1/2 and 1/2 and that might take an hour or so. Its hard to dive past the field and not stop to watch 15 or so little white dots pop up over the tall grass and disappear again to emerge at some other spot. This morning, close to the fence where I had parked in a spot sheltered from the noise of the road by a fallen sycamore tree; a ewe was birthing twins. The first of the lambs, a glistening white when cleaned, was stretching and kicking in just a moment and soon on his/her feet and loving the cool spring morning. The second lamb emerged and before the ewe could clean him/her off the older twin was butting him/her. “The sun was in my eyes. There were no fish in the sea. They told me I should have been there yesterday/tomorrow…they were/will be really bitin’ then. Wrong bait, I forgot to peel the shrimp (palm slap to forehead).” The SWMBO has heard them all. Excuses, reasons, justifications for not for filling someone else’s expectations…of success. Every day that the sun was in my eyes, I enjoyed an incredible day, resplendent with golden light reflected as like on a shattered mirror, dancing over the bay; breezes that captured my line and bent it like a bow that pulled it gently back to shore. Barefoot I stood on the shore, left foot planted in the cool, wet sand, the right in sun baked white powder, rod in hand I executed the wide arc of a cast…not the best, but the bait was out there. In the ocean. That day and every day I walked, drove or in any way ambulated to a body of water with the intention of getting a line wet…was a splendiferous day of fishing. It may not have been a successful day of catching. Fishing and catching are not mutually exclusive nor are they mutually inclusive. Everyone has a bucket list, I guess and yes mine does have something about fishing/catching on it. I want to be standing in a pristine mountain stream that flows with such force that maintaining balance (staying upright) has to be calculated in the cast. I want the fly rod to be the most familiar tool I’ve ever held; because I made it, shaped the cork of the handle, wrapped ever strand of thread holding stainless steel guides in place; meticulously applied each layer of varnish. I will carefully tie the newt that I will offer up to a 5 pound golden trout. The thing about my bucket list, I haven’t listed sharing with anyone else. Who could judge, who would I allow, to judge my good day of fishing. I’m no where near the sea and a pristine stream, in Georgia(? ); fishing is for another day…writing however…well, that’s a different kettle of fish. Yes, that’s on the bucket list as well. I am beginning to forget to have fun and in all honesty; there is no one that can really judge what is fun, for me…it might just have been a day the sun got in my eyes (he said with just a hint of a grin).